Simple, understated, elegant. In Victorian times, wall sconces were called "bracket lights" or simply "brackets". Companies such as HJ Peters of Chicago, and Gibson Gas of Philadelphia made nearly identical brackets, making only minor changes from one another. This is a sconce form that was very popular in those days, and is still being used in today's décor. Place in a series along a hall or down a stairway for easy-to-maintain bulb access. Available in five finishes: polished yellow brass; darkened "antique" finish; nickel plated; matte black oil rubbed bronze finish, or our matte gray pewter finish. Use the menu above to select your finish. Shades sold separately. 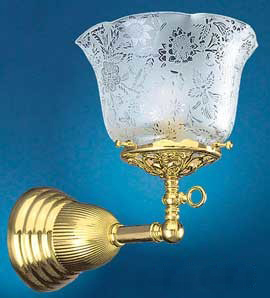 The pierced brass shade fitter is a 4" up-style gas type. We picture an etched floral shade as a suggestion. Other 4" fitter shade options can be found by clicking here. Changing the shade will completely change the look of this fixture from Victorian to contemporary. If you'd like an On/Off switch added to the base, we offer custom installation of the switch for $25.00. Please click the "Yes" option in our "Add Switch?" menu above to add the switch to your order. Height: 10" high (with pictured shade). Width: 7 ½" (including pictured 073G shade). Projection: 10" from the wall into the room. Wattage: One socket, up to 100 watts incandescent. Pictured here also is the matching two-light fixture, both with two gas lights (up), or a gas and electric (up & down). Pair this sconce with ceiling fixtures 712-DGS-EP (two-light) or 714-QGS-CH for a charming, yet practical, lighting solution. Save on freight by placing several products in one order.